It’s Friday May 27th and our Down East Circle Route adventure has begun. Our friends Bob and Jan on Wings and Dave and Judy on Sir Tugley Blue arrived Wednesday night after a week’s cruise from Lake Michigan to get to our marina in Penetanguishene. We all spent a day getting final organizing completed and various odd jobs completed. 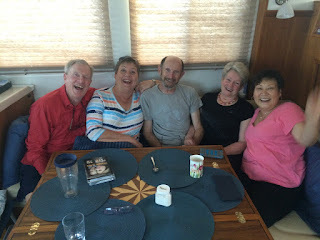 Last night, Fran put on a lovely dinner of Chicken Cordon Blu, fresh asparagus, salad and pearl cous cous, providing us a great opportunity to catch up and to plan the days ahead. 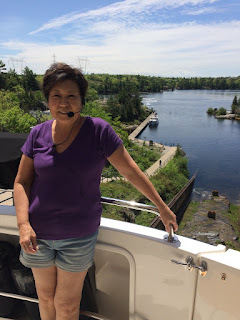 Friday we were all up early and we were off the dock by 0830 heading to Port Severn on the most perfect day imaginable - sunny, light north wind and warm. Locking was a brand new experience for Wings so we’d had long conversations about successful locking techniques. The lock masters at Port Severn were wonderful, providing Bob and Jan with a smooth and comfortable experience. 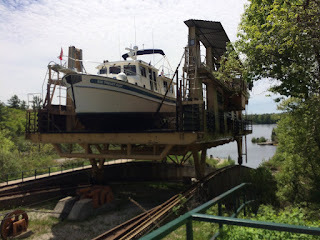 The Trent-Severn Waterway is a 240 mile long canal route connecting Lake Huron at Port Severn to Lake Ontario at Trenton. 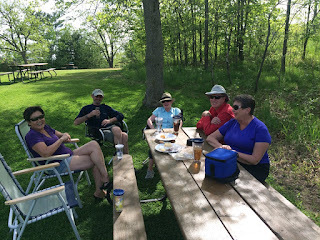 It is a scenic, meandering route passing through the Severn River, Lakes Couchiching & Simcoe, the Kawartha Lakes, the Otonabee River and the Trent River. It was originally surveyed as a military route, but the first lock built in 1833 was a commercial venture. 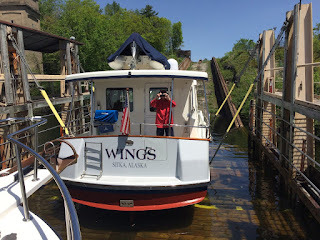 This lock connected a number of lakes and rivers near the centre of the waterway opening a large area to navigation by steamship. 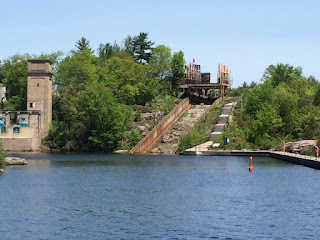 A few more locks were built, but when the Upper Canada Rebellion of 1837 broke out, the government re-evaluated the project and concluded there would be too many locks for rapid movement for military purposes so the project was halted, leaving the completed inland section with no outlet. The Dominion of Canada in 1867, led by John A. Macdonald restarted construction with an eye to the commercial benefits. Changes in governments, World War I and other events caused delays by eventually the system was completed with the first transit from Lake Ontario to Georgian Bay done in 1920. However, by 1920, railways were moving goods and larger ships were plying the Great Lakes, none of which could fit in the locks, so the Trent-Severn’s original commercial purpose was no longer viable. The introduction of motor boats and cottage country, along with tourism make the Trent-Severn perfectly positioned as a cruising and vacation destination, giving it new life. Today it is run by Parks Canada and it is responsible for large amounts of employment in the tourism business and tax revenue for provincial and federal governments. Our second "lock" of the day was the Big Chute Marine Railway. 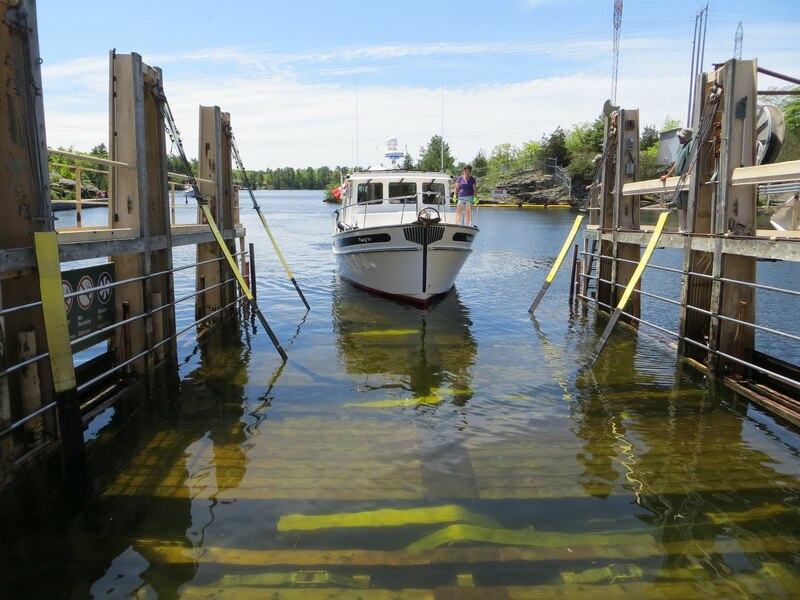 It is a giant cart that transports boats from one lake to another, over land, a height of 60 feet. It is very exciting for the boats as well as the spectators. See pics below. Ok, that’s it for history. Here are some pictures from today’s cruise.